Cimicifuga racemosa of Michigan Flora. Collected in Hillsdale Co. by the First Survey in 1837, and then in 1918 from a farm woods in Superior Tp., Washtenaw Co. (B. A. Walpole 730, BLH). It is commonly now cultivated as an ornamental and probably in the past for medicinal uses. 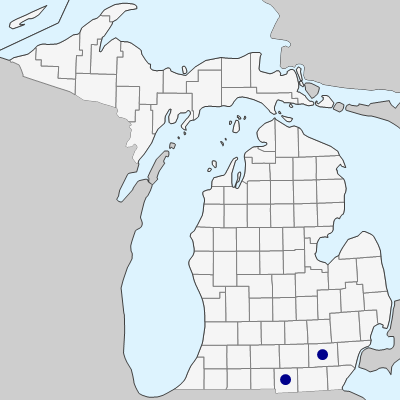 The species is far from its continuous native range in Michigan, and is very likely spread from cultivation despite the very early collection by the First Survey. 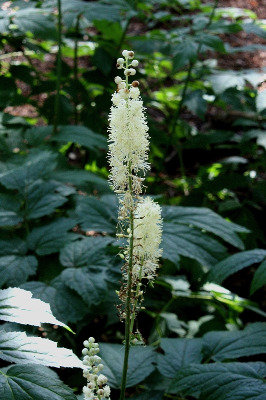 The foliage is very similar to our two common species of Actaea, but the dry fruits are quite different. Compton, Culham, & Jury (1998), however, show the very close relationships of these species. MICHIGAN FLORA ONLINE. A. A. Reznicek, E. G. Voss, & B. S. Walters. February 2011. University of Michigan. Web. April 22, 2019. https://michiganflora.net/species.aspx?id=2366.